South Africa’s new vehicle sales industry remained under pressure for the second month of 2018, with a total of 46 347 new vehicles sold – a year-on-year decline of 3.8%. According to the National Association of Automobile Manufacturers of South Africa, the largest sales declines in February were seen in the rental channel, where sales fell almost 30%, and government channel, where sales were down 42%. 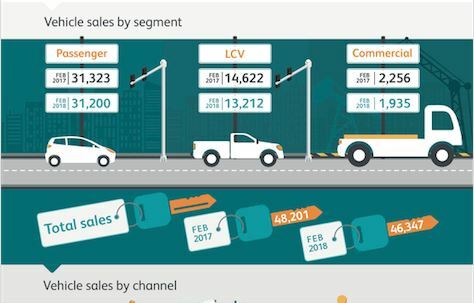 By contrast, sales through the dealer channel grew 2.9% – a positive development for a segment that accounted for 79% of total sales in February. The growth in dealer sales is corroborated by WesBank’s vehicle finance application data, which measures consumer demand. In February, demand for new vehicles grew 11.6%, year-on-year. Demand for used vehicles remains positive (up 6.5%), but continues to be outstripped by consumer appetite for new models. This is evidence that consumer demand is shifting back to the new market. However, the positive sentiment among consumers may be short-lived, going forward. WesBank is aware of the potential impact of the recently announced increases in VAT and ad valorem taxes, and any increase in car prices will negatively impact vehicle sales. The industry will evaluate the full impact of how this will affect vehicle prices and the implication on vehicle-buying behaviour. WesBank will deliver its full vehicle sales forecast for 2018 on 13 March 2018, at the WesBank SAGMJ Car of the Year Banquet, at Gallagher Estate.